U.S. Drones Kill 13 Suspected Militants In Pakistan : The Two-Way The strikes are the first by the U.S. in nearly six months, and come just days after the Pakistani Taliban staged an audacious attack on Karachi airport, Pakistan's largest. An unmanned U.S. 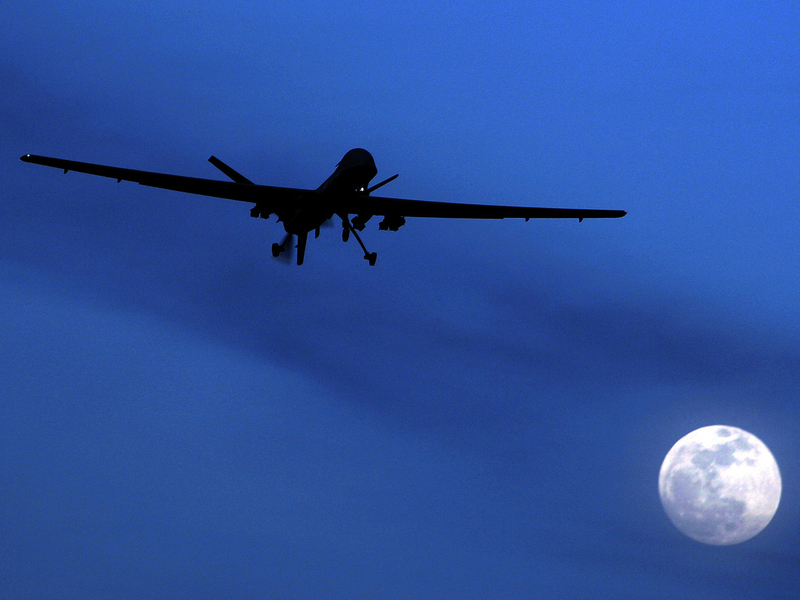 Predator drone flies over Kandahar Air Field, southern Afghanistan, on Jan. 31, 2010. U.S. drone strikes killed at least 13 people in two separate strikes Wednesday and Thursday in Pakistan's tribal area. The U.S. resumed its drone strikes inside Pakistan, killing at least 13 people in two separate attacks on militant areas late Wednesday and early Thursday. At least 10 people were killed in the CIA drone strike on Thursday when, according to The Associated Press, two drones "dropped three missiles on a militant compound and a vehicle in the town of Ghulam Khan." The news agency quoted two Pakistani intelligence officials. Earlier, a U.S. drone fired two missiles Wednesday at a facility in North Waziristan, killing at least three people, the AP reported. The drone strikes inside the country are the first by the U.S. in nearly six months, and they come just days after the Pakistani Taliban staged an audacious attack on Karachi airport, the country's largest. Those attacks have put pressure on the government to launch an offensive against the militants in North Waziristan, where the CIA strikes occurred. Two unnamed Pakistani government officials told Reuters that Islamabad had given the Americans "express approval" for the strikes. But a statement from the Ministry of Foreign Affairs condemned the attacks, calling them a violation of Pakistani sovereignty and territorial integrity. "Pakistan military sources said six militants including four Uzbeks were killed in the first strike on Wednesday around five km (three miles) north of Miranshah, the capital of the North Waziristan tribal region where Taliban insurgents are holed up. The second attack killed four militants in the same area around 2 a.m. on Thursday."